It starts with a really terrible picture spreading like a bad cold around LinkedIn. This picture, in particular. Like most viral content, it’s oversimplified, didactic, and supposedly funny. It taps into the zeitgeist, gaining strength (and shares) by simply “confirming” the things people already believe to be true. It, more than any other viral picture in recent memory, bothers me to no end. The message of this little cartoon is clear: the thinker is a lazy intellectual who sits around all day; the doer — why, he’s out doing things, accomplishing goals, changing the world, selling his startup for gobs of money, dating supermodels, etc., etc. 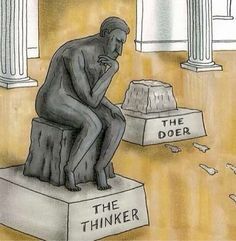 Be the doer, not the thinker. The doer embodies what The New Statesman calls “the modern cult of spontaneity,” the pervasive school of thought that fetishizes fast action, instinct, and reflex and shuns those who take the time to think things through. The cult of spontaneity takes some of its cues from the anti-intellectual movements which have long plagued the American population (Isaac Asimov once said, “The strain of anti-intellectualism has been a constant thread winding its way through our political and cultural life, nurtured by the false notion that democracy means that my ignorance is just as good as your knowledge”). “… we have a ‘System 1′ brain that delivers snap, intuitive judgements through unconscious processing, and a ‘System 2′ brain that does the slow, cold reasoning. We’ve established why this cartoon is so virally successful: it oversimplifies the world (you’re either a thinker or a doer); it carries an easily digested message (be the doer, not the thinker); it taps into the zeitgeist (spontaneous action good! Thinking bad! ); and it’s supposed to be funny (I think?). Now, let’s establish why this drawing bothers me so much. It’s not the oversimplification (though, I do dislike that). It’s not the condescending didactic manner of the cartoon (but, yes, I do dislike that, too). It’s not even the reinforcement of puerile pop culture myths or the total lack of humor (as you probably guessed already, I dislike those things as well). No, what really bothers me is how patently wrong this cartoon is. You don’t want to be a doer. You want to be a thinker. 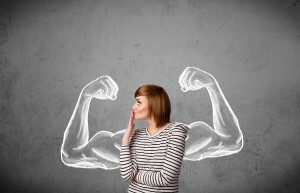 You want to take the time to plan, reason, and investigate before you do anything at all. This leads to better results when you do finally act. You know who thinks before they act? Michael Phelps. As Danielle Schlanger explains at Business Insider, “Olympic swimmer and 14-time gold medalist Michael Phelps reviews every possible scenario that could occur during a race before he even gets in the water.” Schlanger also mentions Captain Sully Sullenberger, famous for landing his disabled plane in the Hudson River, saving the lives of everyone on board. It’s a good thing Capt. Sullenberger decided to think things through, rather than instinctively heading for the nearest airport. Heck, even fruit flies think before they act. You know who doesn’t think before they act? Children. Do you know why children don’t think before they act? Because they cannot “comprehend the consequences of their actions, think about future events, or realistically gauge how other people view their actions.” Children literally lack the hardware to do this. The neural network responsible for these behaviors is not fully developed until 13 years of age. But, sure, let’s throw away the complex and powerful capacities our brains develop over time. Let’s revert to the childish way of behaving. Don’t think! Just do! Unless, of course, you’d like to be successful. I’ll take the example of Michael Phelps over that of the neighbor kids any day.